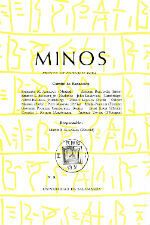 MINOS, an international review of Minoan, Mycenaean and Cypriote studies, was first issued in 1951 as a series of fascicles by Professors Antonio Tovar and Emilio Peruzzi. It then appeared in regular volumes of approximately 240 pages per year. MINOS is devoted to Aegean and early Greek languages and linguistics and their related cultural environments and to study of the writing systems and interpretation of the texts in which these languages were recorded. The current editors and the editorial board encourage submission of scholarly articles that help to illuminate any of these topics. Prospective submitters are advised to refer to recent numbers in order to get a sense of the range of subjects addressed in the pages of MINOS and the style and format for articles. Submissions in MSW format following the conventions of MINOS are preferred. The contents of the most recent volume of MINOS (vol. 39, 2016) can be found here. Several volumes published between 1951 and 1990 can be found online at http://campus.usal.es/~revistas_trabajo/index.php/0544-3733/index. 16. L. Dubois and E. Masson eds., *Philokypros. Mélanges de philologie et d’antiquités grecques et proche-orientales dédiés á la mémoire d’OLIVIER MASSON, 2000, 316 pp. 15. Jan Driessen, The Scribes of the Room of the Chariot Tablets at Knossos, 2000. 391 pages. 14. Ivo Hajnal, Sprachschichten des Mykenischen Griechisch, 1977. 274 pages. 13. Nicolle Hirschfeld, The PASP Data Base for the Use of Scripts on Cyprus, 1996. 367 pages. 12. José L. Melena and Jean-Pierre Olivier, TITHEMY. The Tablets and Nodules from Tiryns, Thebes and Mycenae, 1991. 98 pages. 11. The Knossos tablets. Fifth Edition. A Transliteration by John T. Killen and Jean-Pierre Olivier, 1989. 494 pages. 10. Jean-Pierre Olivier and Thomas G. Palaima eds., Texts, Tablets and Scribes, Studies in Mycenaean Epigraphy and Economy Offered to Emmett L. Benntt, Jr., 1988, 392 pages. 9. Jennifer K. MacArthur, Place-Names in the Knossos Tablets. Identification and Location, 1993. 312 pages.